There are 6543 posts in this topic. You are on page 81 of 131. 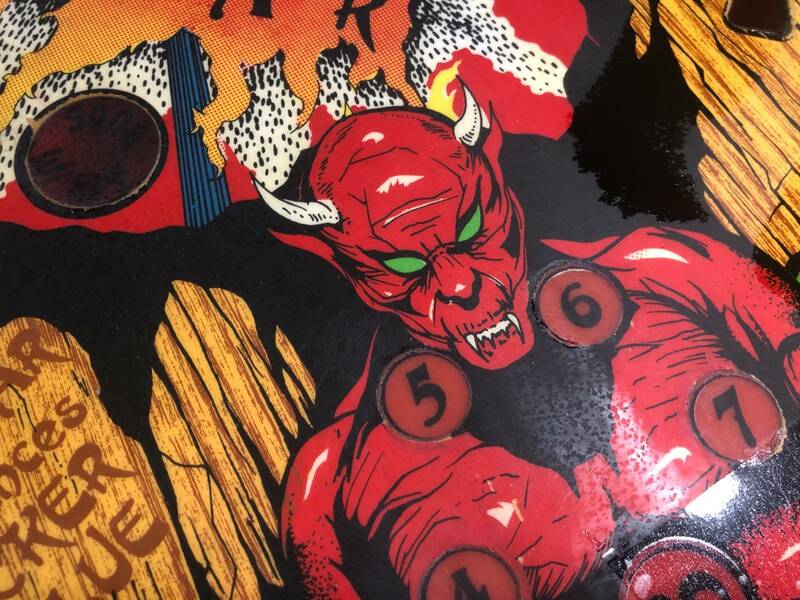 What causes ghosting on inserts? 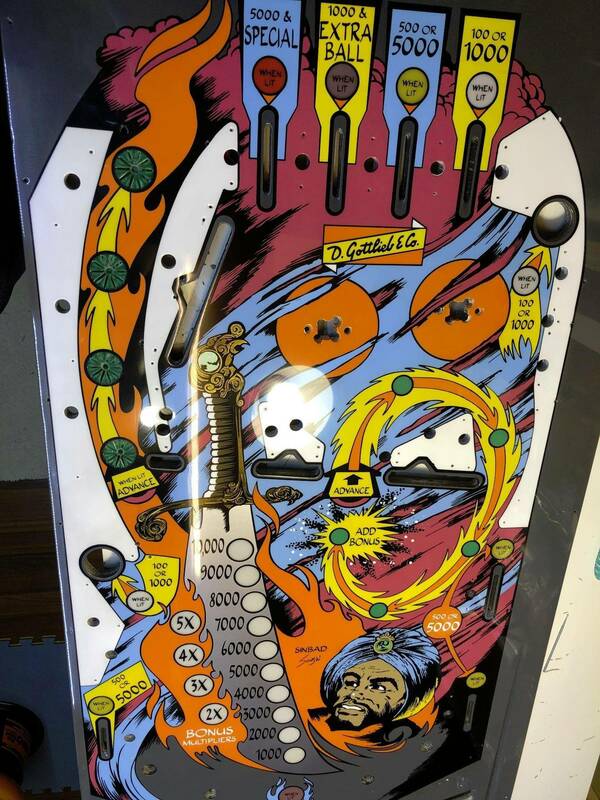 I have a Shadow playfield I restored, cleared color sand and buff and in the last couple months I've been noticing ghosting near the insert edges. Any way other than starting over to fix? 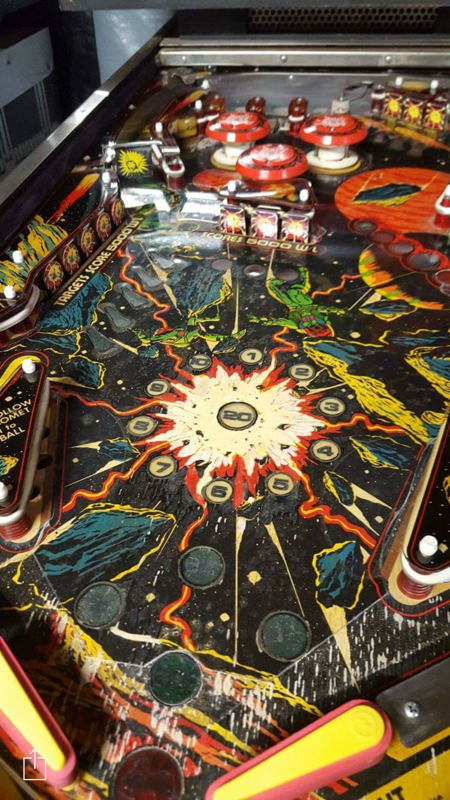 Vid,I wanted to personally thank you for this Guide,I have read it several times and it has helped greatly with my current(and first) Playfield restoration. Though my project is an EM and not as complicated as some of these issues covered for later-model machines I feel your information gave me the confidence to "Go for it". 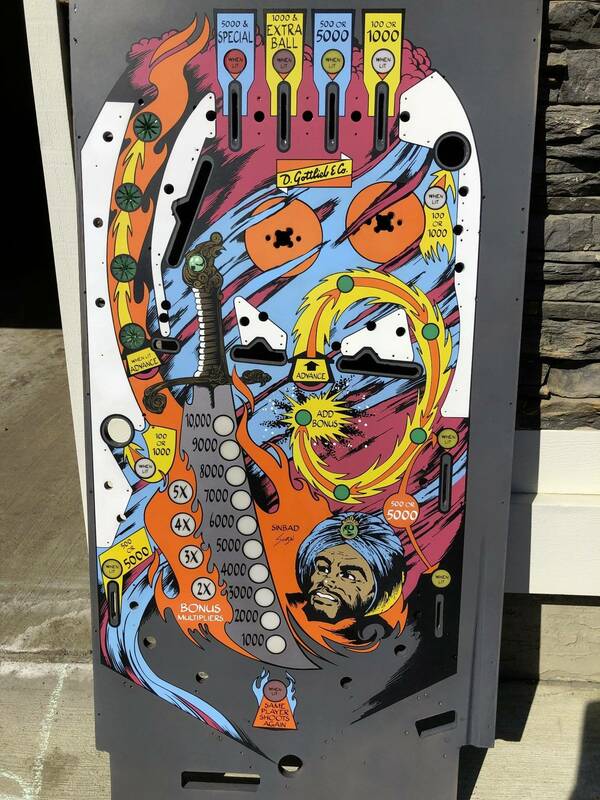 I will Post pics of the finished Machine when completed. That's just normal insert movement. 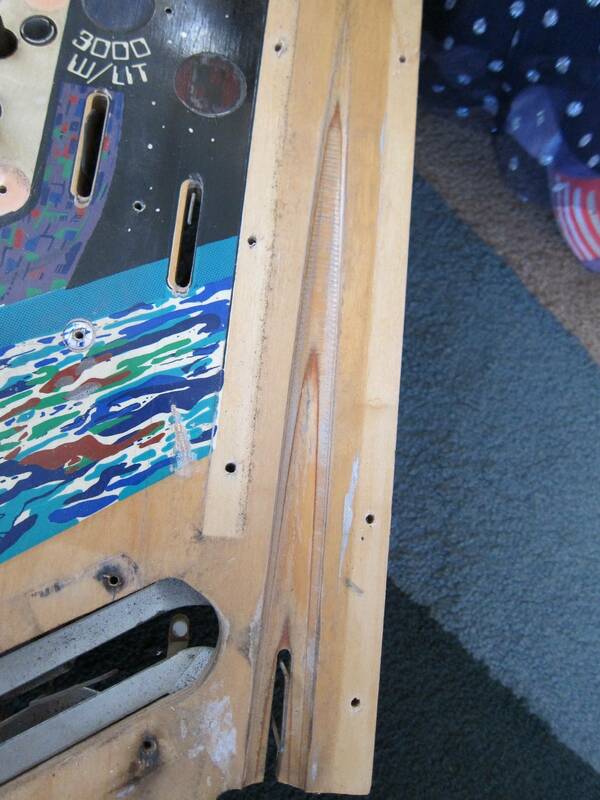 That is why I glue all the inserts from behind before clearcoating - try and keep them from moving. 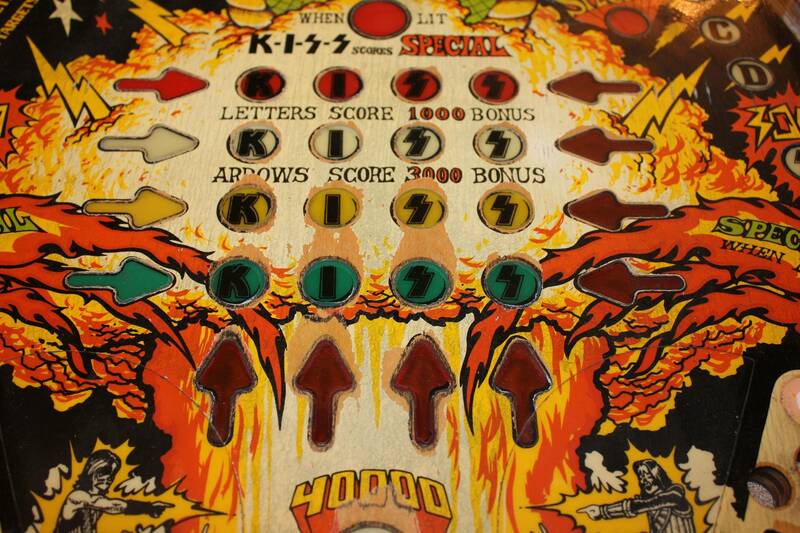 Long story short.. bought a "roached out" KISS project/parts game over 10yrs ago. 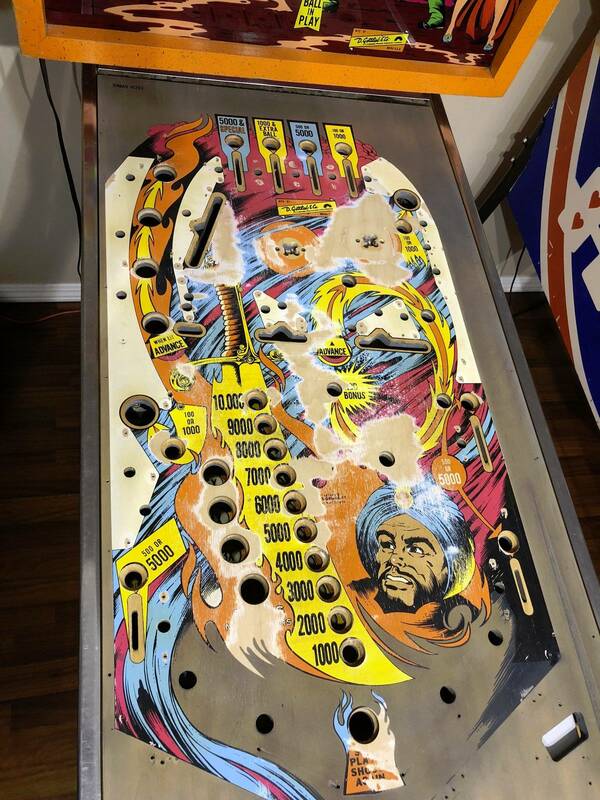 Missing bg, game had smoke damage, so playfield yellowed on top of flaking badly, cabinet so/so.. really a basis to use repro parts. 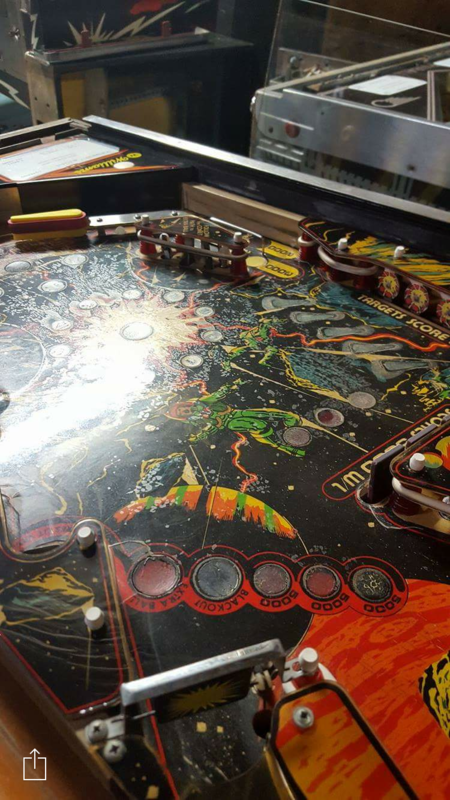 Bought this slightly worn playfield from a Pinsider a year or so ago. It's absolutely restorable, but my biggest issue is the 40,000 and 80,000 text. I have sprayed 2pac, done some touch ups, it's not completely new to me. 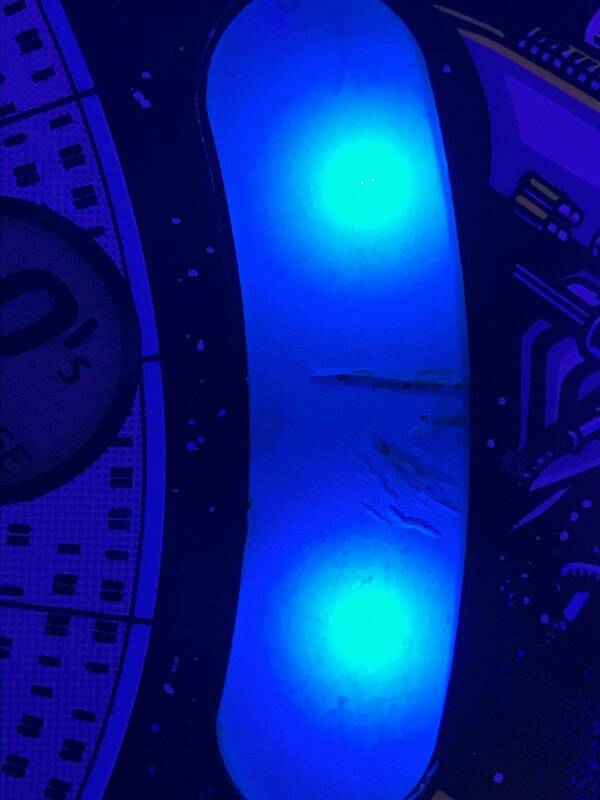 I think the best/only way to rectify this wear would be using decals. 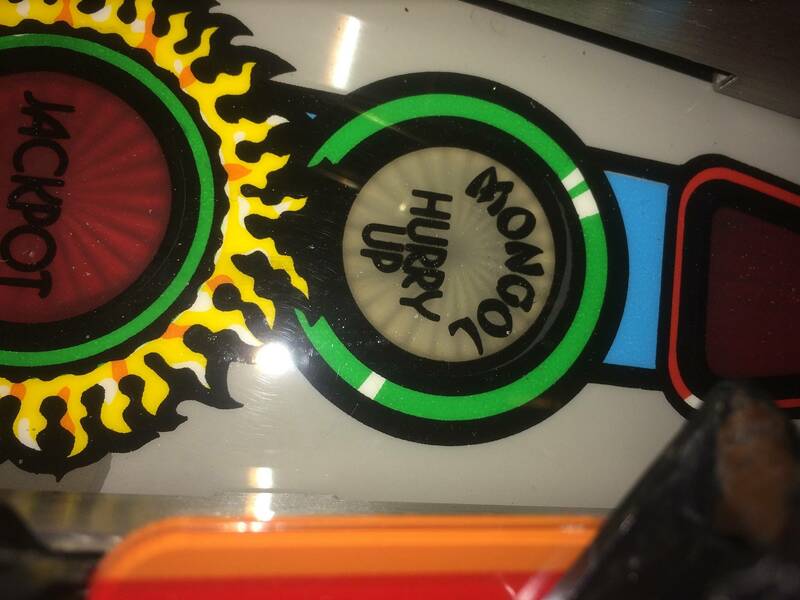 Don't wanna go the Classicarcades route, plus I don't need all of that. I can barely find time to do anything. 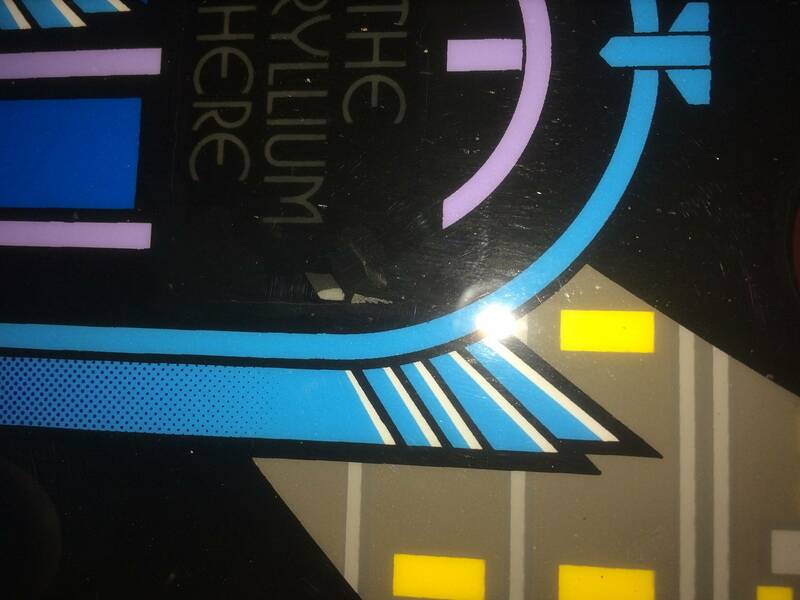 Is there ANYONE on Pinside that could make decals for the text, possibly just the black layer, for pay? I understand the how, and have a high res photo of a good one to work from, but at this rate, I'll never get around to it, as the decals seem like a mini project in themselves. Also, the grid looks like it would be a PITA to repair. Make sure you post your results here for others to see! Before and after pics would be great. 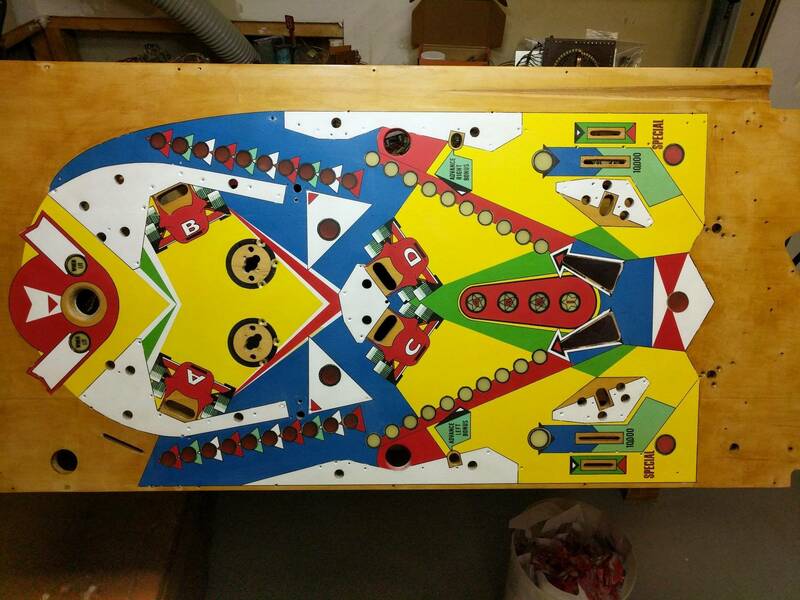 Got my playfield back from the clearcoating dude. Overall very happy. 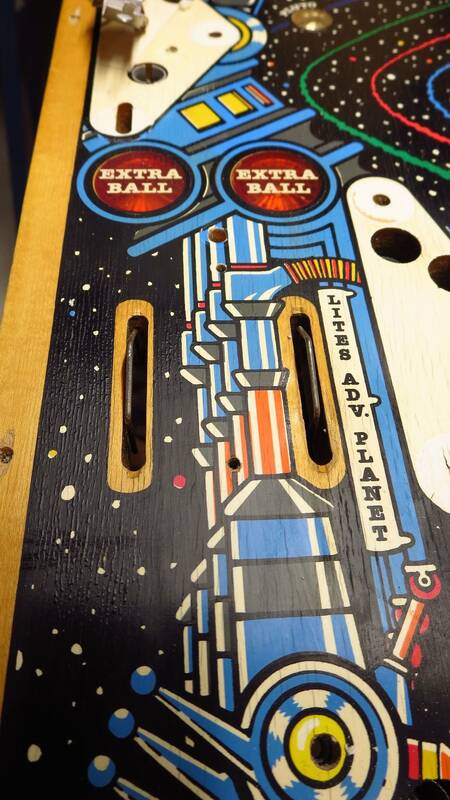 He did some black touch-ups using the wipe method to fill the cracks on bare wood as my playfield was quite dry. Make a world of difference. 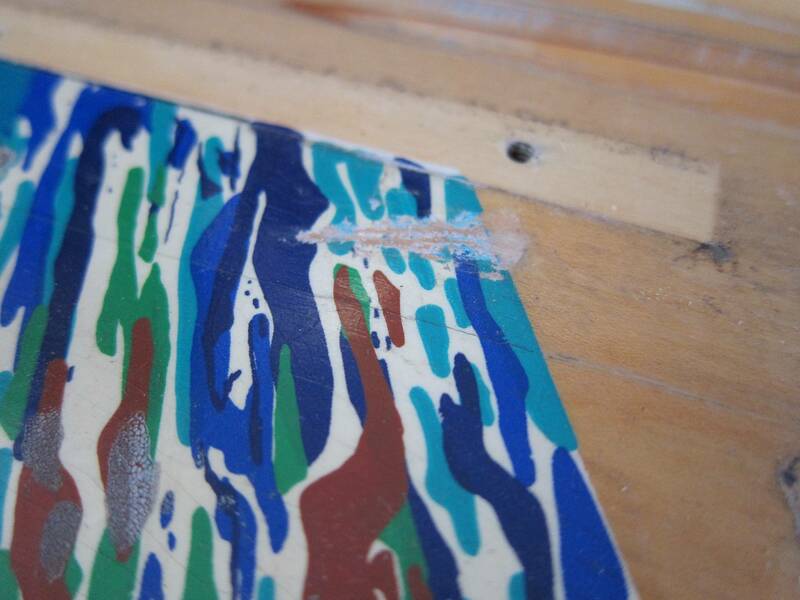 The base/seal coat was very thin as suggested I believe and filled in the cracks and insert as expected. Leaving a rough but sealed surface. I'll rough up the surface and start my painting. 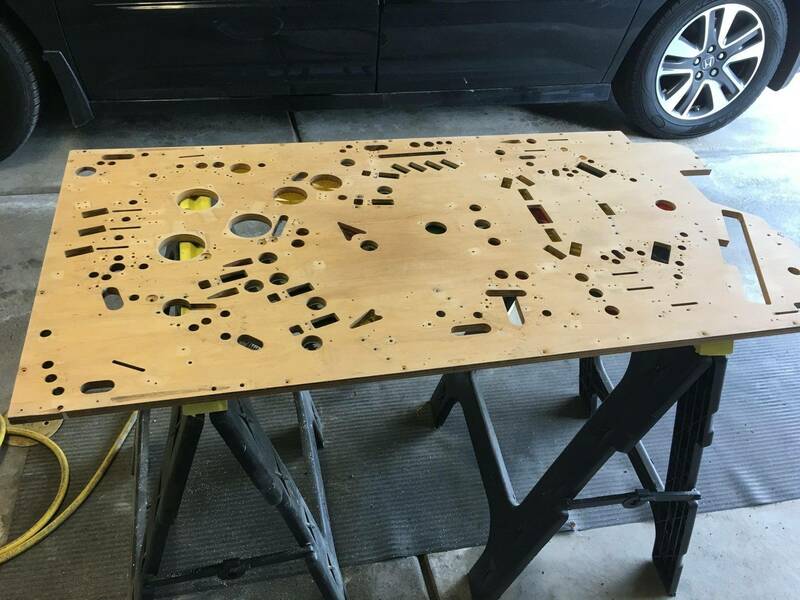 What grit should I sand with, I read from 400 to 800 depending on who I ask to. This looks great, Plumonium! I'd like to get some pointers as I'm planning on going down this same path. 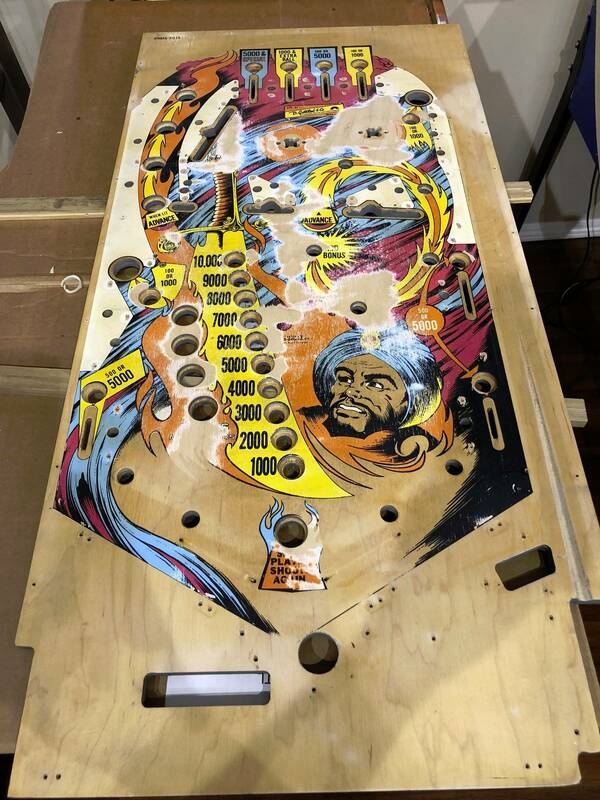 You can check out my restoration thread and back up a few posts to get more info on my playfield process. I'm just doing was others have done really... aka ask Vid. From Wiki: Coleman fuel is a mixture of cyclohexane, nonane, octane, heptane, and pentane. 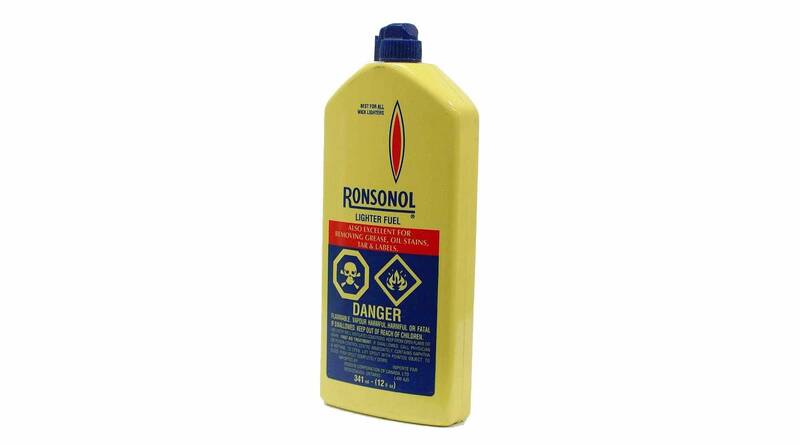 Naphtha seems not always available here in Canada. They have it in-store at Cloverdale Paints. Well it seems my base clearcoat did not adhere very well. 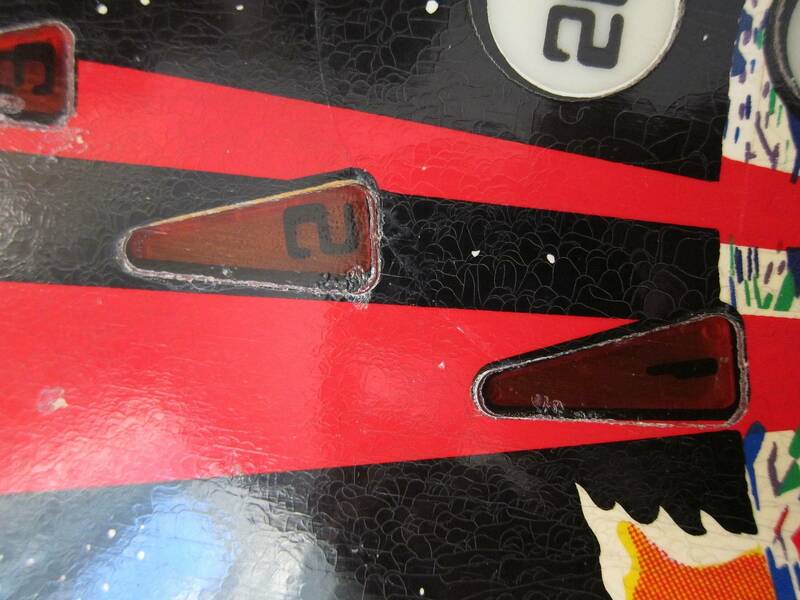 While installing my first frisket mask and peeling it off I noticed some flaking on the edges. 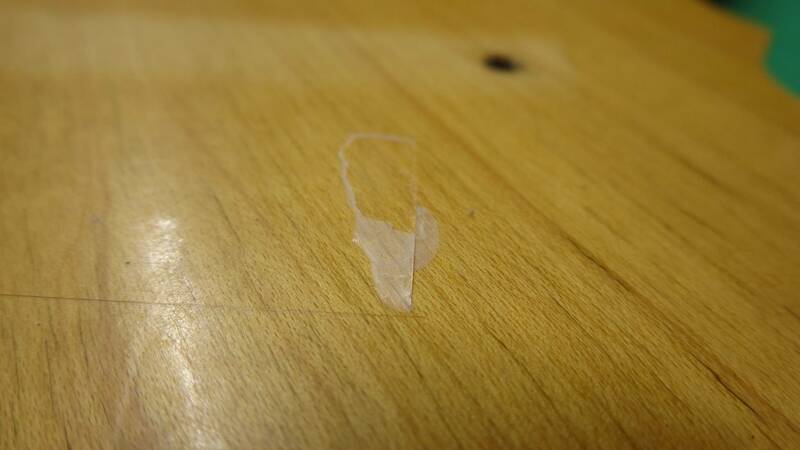 I wasn't sure if it was glue from the frisket or the frisket itself, perhaps the clearcoat. I did a test under the apron area. Maybe I was too aggressive with the exacto knife but the clear should not lift that easily... Now I'm afraid painting over this the clear to see the base clear to starting to lift and ghost all over the place down the road. Naphtha seems not always available here in Canada. Any alternative? Available at Canadian tire for 5 CAD. 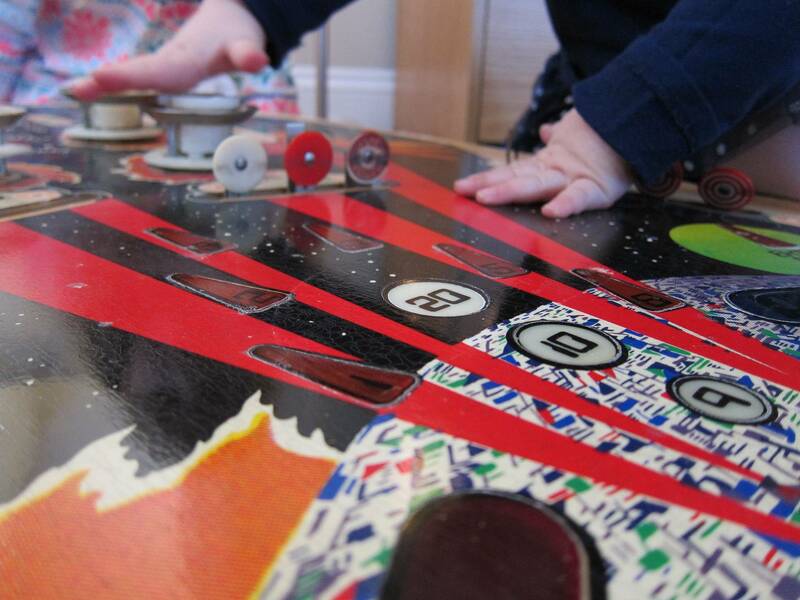 Used about a bottle and a half to fully clean and refurbish a pretty grimy playfield. Does it still smell, like it's not 100% cured? Did you cut all the way through it with the razor? It still smelled. 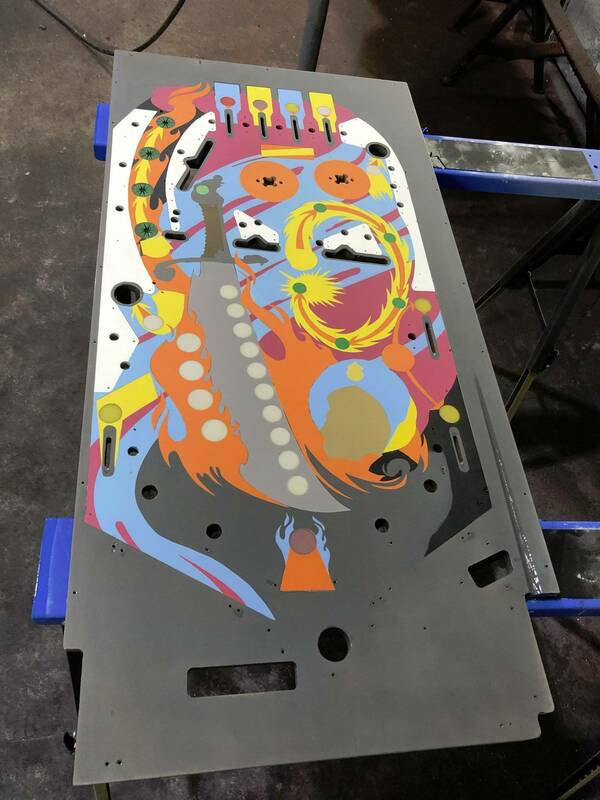 I contacted my clearcoat guy and said he advised me not to sand or work the playfield for at least 2 weeks. I guess my bad. I can understand the clear is still soft but will it adhere more as it cures? 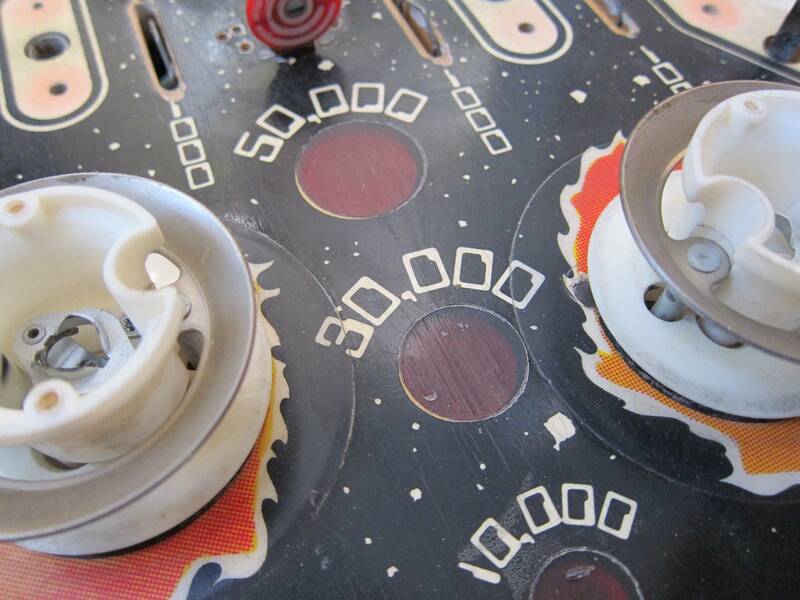 How long should someone wait for the playfield to cure? I guess I did cut through even though I put very little pressure on the blade. I did not expect that. Depends on the hardener he used. When it stops stinking, it's cured. Medium, that was 8 days ago. It smelled if I put my nose right in it, smelled slightly more as I sanded. I'll give it more time. Interesting. The clear I purchased at NAPA cured very quickly (within 24 hours). I remember Vid mentioning something about Canadian products possibly being different (stricter regulations about VOCs, maybe? ), as CPR always recommends a 6 week waiting period before repopulating one of their playfields. May warrant further consideration, as people in different countries may be using products that require varying degrees of cure time. Vid, When doing final fine grit sanding after the final coat of clear, are you sanding a circular motion or vertical/horizontal motion? And also, do you switch block style, or continue to use the dry wall sander? When doing final fine grit sanding after the final coat of clear, are you sanding a circular motion or vertical/horizontal motion? And also, do you switch block style, or continue to use the dry wall sander? I use an air-sander so I can wet-sand. Ok, and I forgot to ask. When polishing what types of pads are you using? I wanna hit harbor freight and pick up what I need. You will need foam pads for cutting, polishing and finishing that will fit your buffer. You will also need compounds for each pad - don't mix them up! Hey Vid, restoring a time warp and removed all inserts becuase they were all loose. 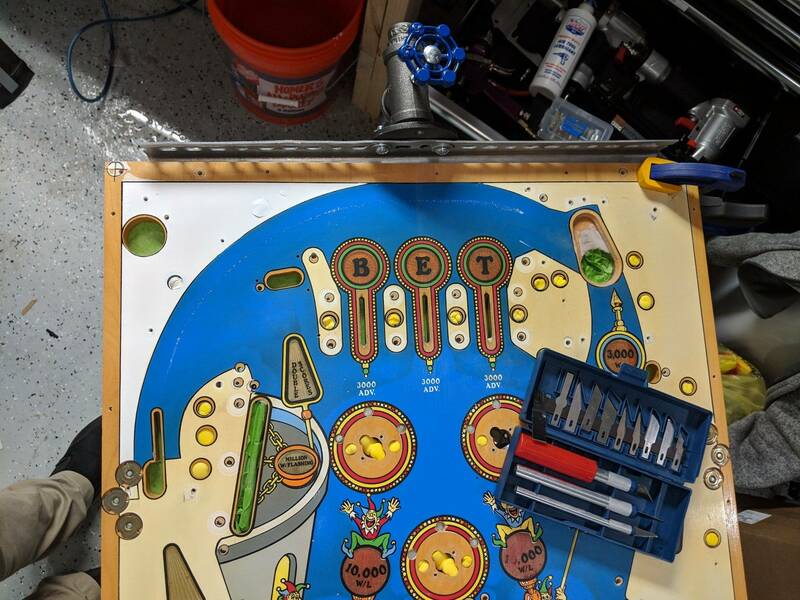 Cleaned old mastic from holes and would you say it's better to make inserts perfectly flush with playfield ( all cupped FYI) or push them into until they bottom out on the step of the hole? The ladder puts them just shy of flush, maybe .02". 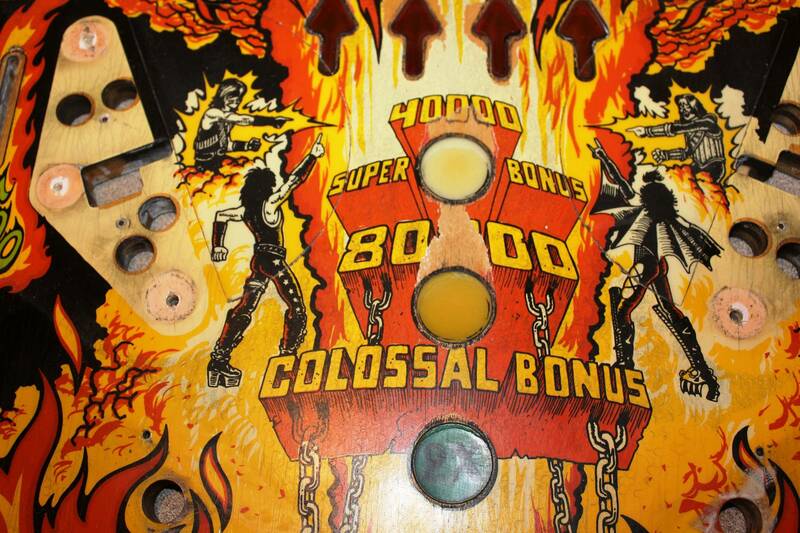 Would you even touch this playfield? If you can glue them against the shelf hole, they are less likely to move than if you leave them floating. It looks like a good restoration candidate. Can I see a pic of the "most"??? To me this is significant. Thank you for sharing your thoughts. Yes but in your experience, would you say the .02" + cupping could be filled with clear? 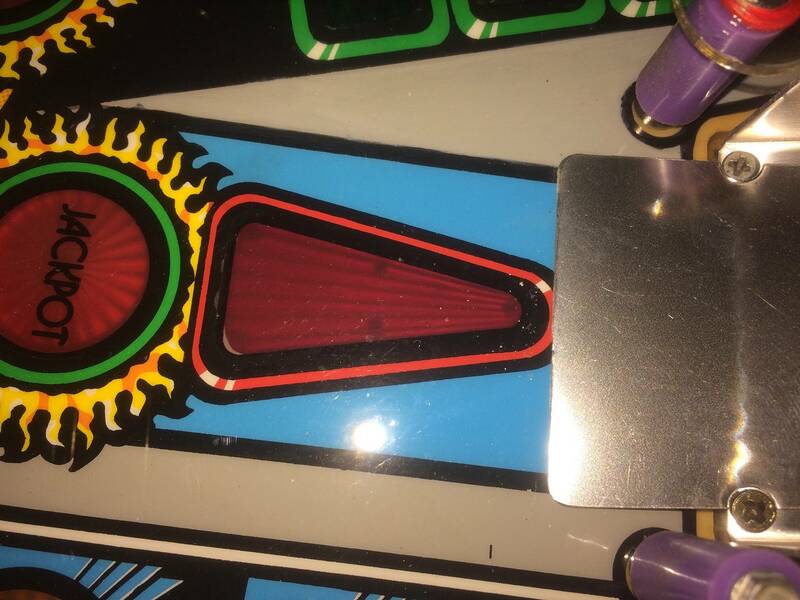 Also it appears my time warp uses quantity 3 1-1/8" diameter round inserts, I cannot find these on marco or pinball life, any idea on where to get them? Yes, no problem filling with clear. There are some inserts that have not been available for many years. 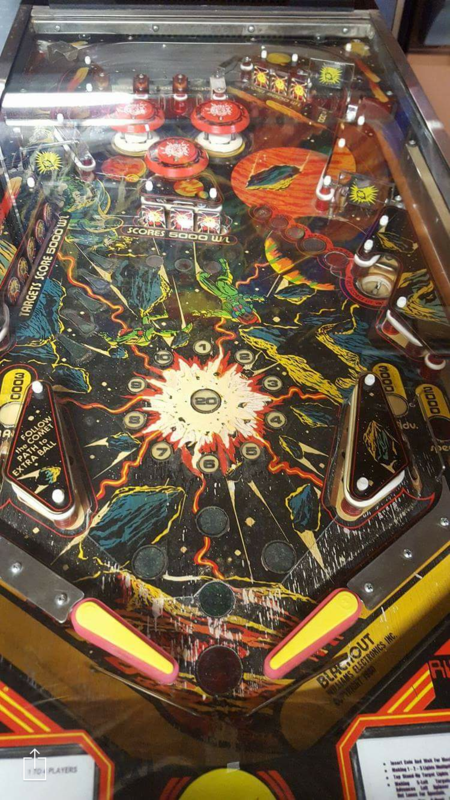 Vid, is Diamondplate any safer for mylar removal compared to older games? 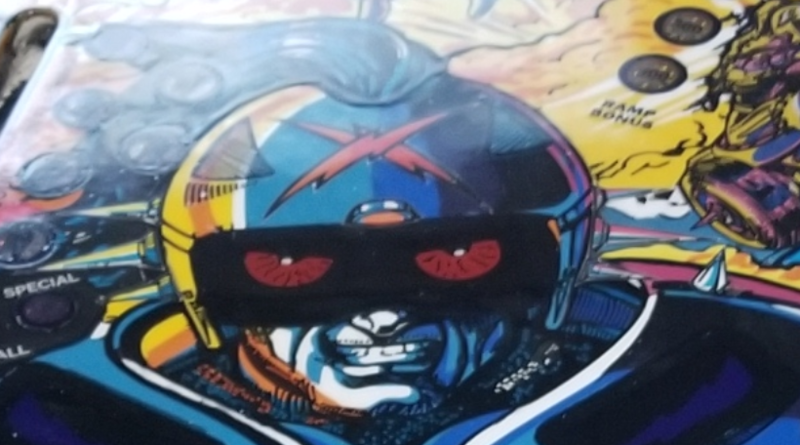 I've got a Black Rose with some mylar in front of the flippers, making the ball deflection from the cannon even worse, but I'm afraid to remove it as it's the most noticable area of the whole game and it's practically invisible right now. 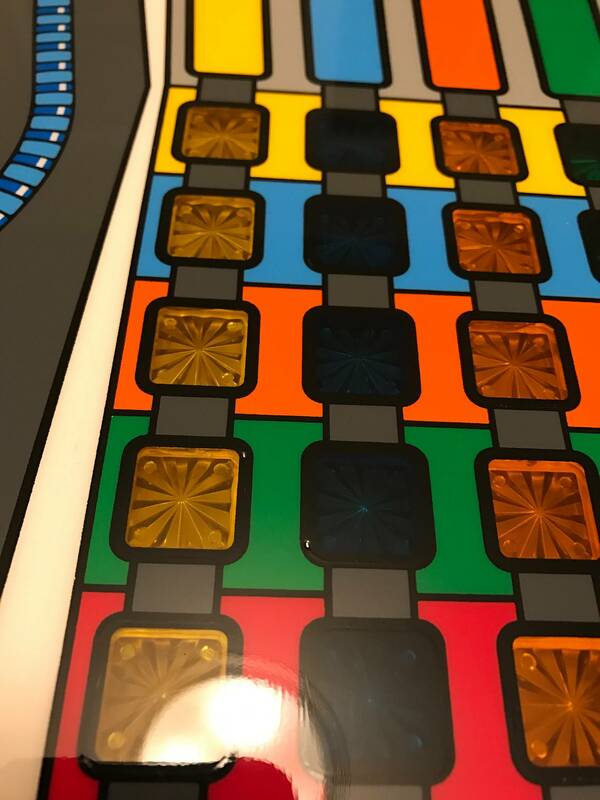 Diamondplate is a little safer, but if the game was ever stored in an unheated garage, all bets are off. 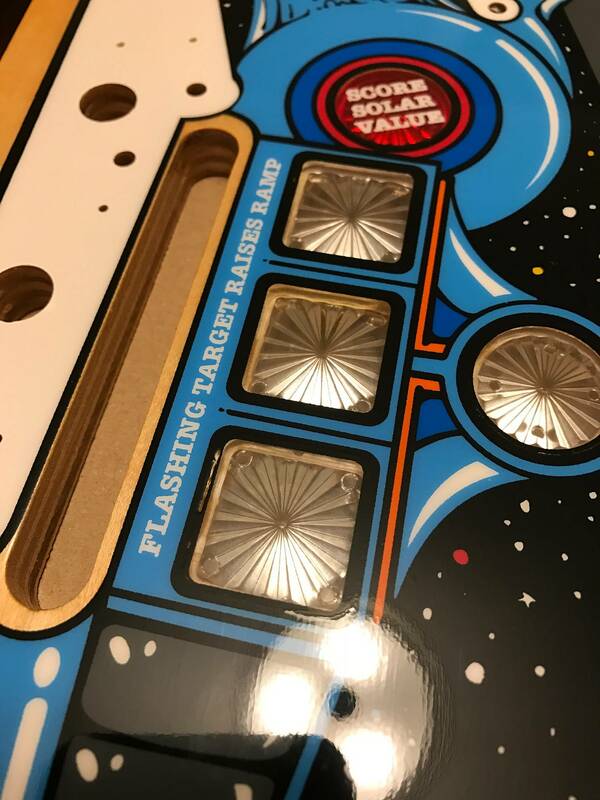 Close up, you can see that most of the inserts are practically level, if even slightly proud, they are easily pushed back down. Slight cupping, very slight, which I think can be easily filled with your clear method. 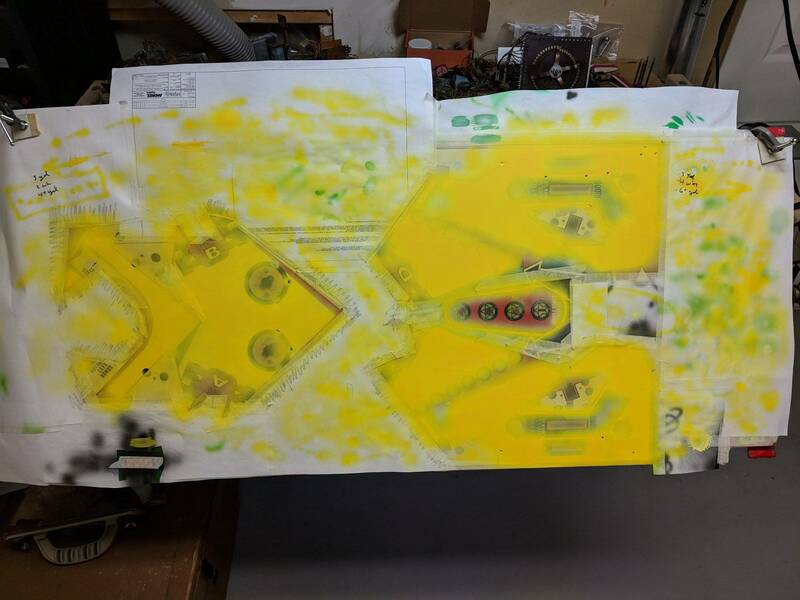 Otherwise, the pitted areas around the inserts, is it better to leave them as-is, and try to fill around them with bondo, or just remove them (as they need to be re-glued anyway) and fill the sides, paint, and reinstall them? As you can see, my young daughters also want to help! 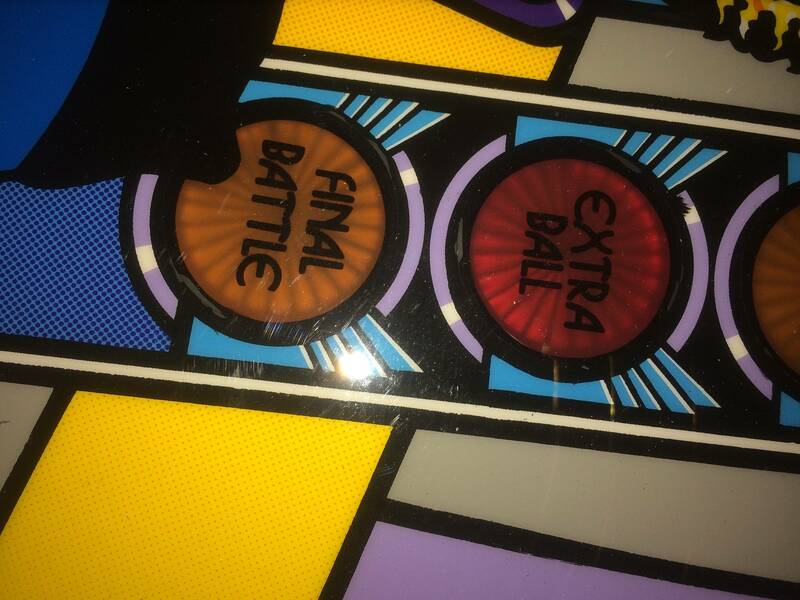 There are a few areas that the paint has been scratched out, either by removing the metal cover from the ball return or something else. They don't look that bad. Lastly, the shooting lane doesn't look too bad. 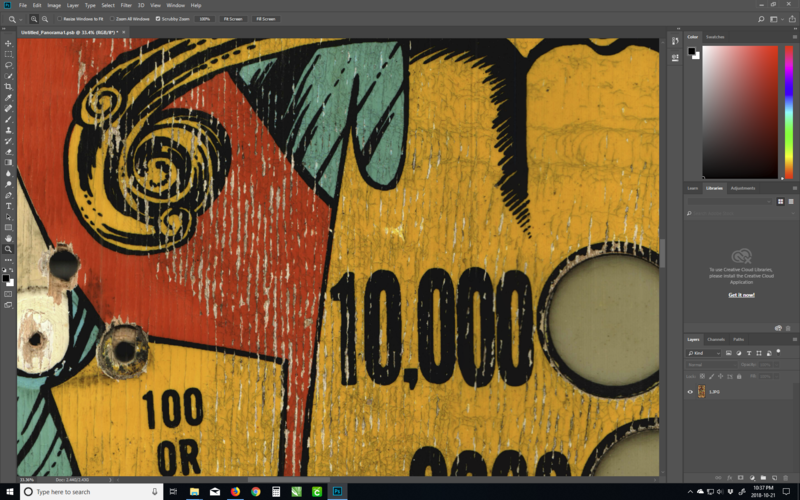 There's a few rough areas of grain, would these be best off filled? My final question: This thing looks like it has, as you have previously stated, the most pathetically thin coat of clear, if anything. 91% alcohol and the Magic Eraser, I'd assume? a year. 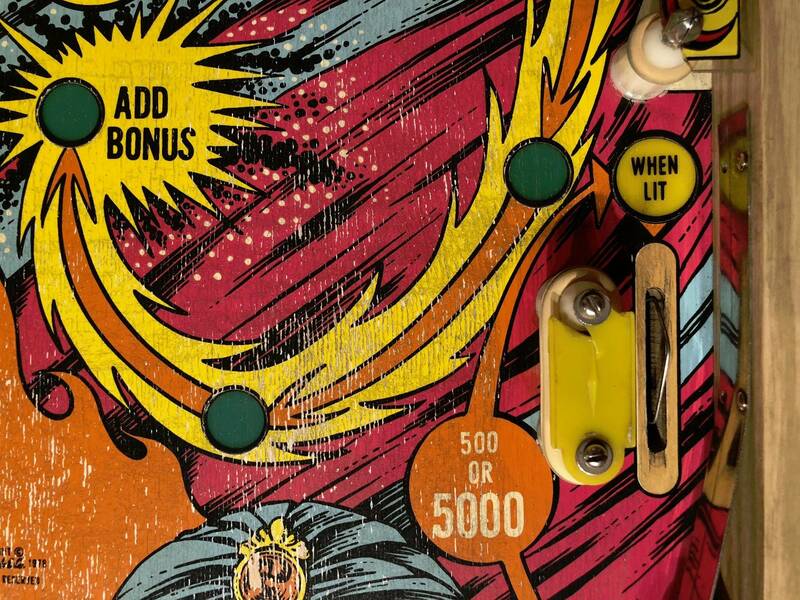 The pinball life expectancy was five to six months to a year or so. moment in time. They call the process engineered obsolescence. That's true, you are right. Longevity wasn't the plan. Close up, you can see that most of the inserts are practically level, if even slightly proud, they are easily pushed back down. Those inserts should be glued back down. The glue is no longer holding. 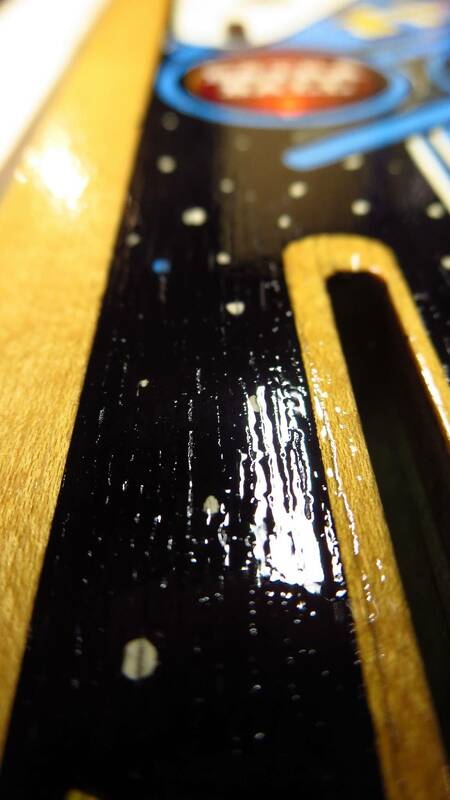 Glue the inserts down, paint the black keyline again, then fill with clear. 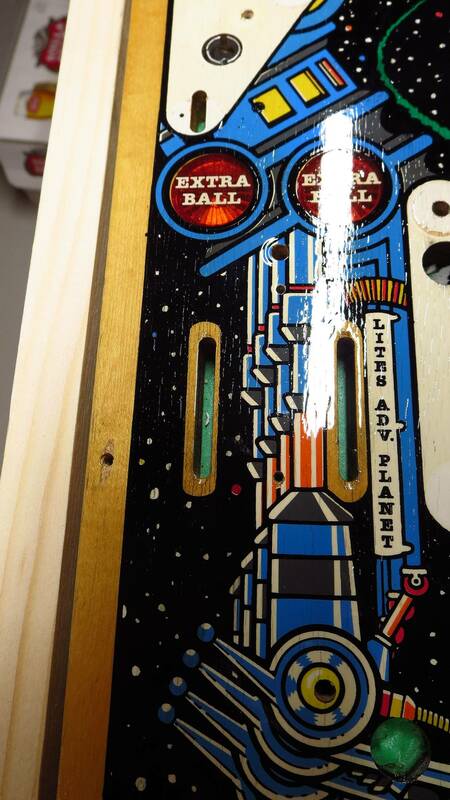 The valley around the insert will fill too. 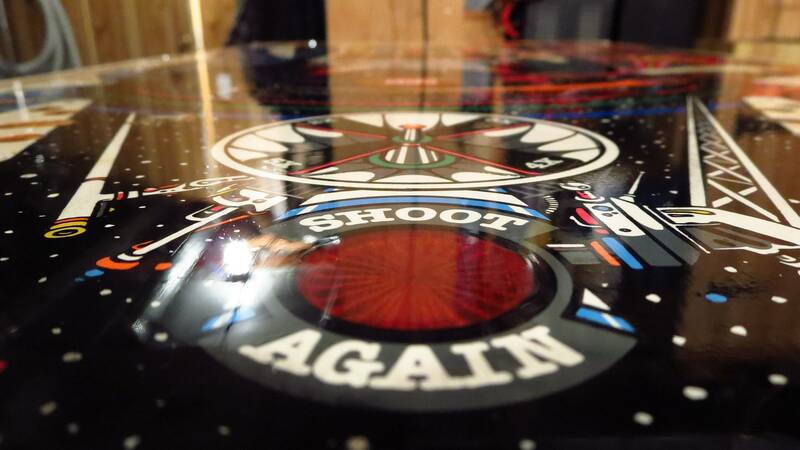 Lastly, the shooting lane doesn't look too bad. 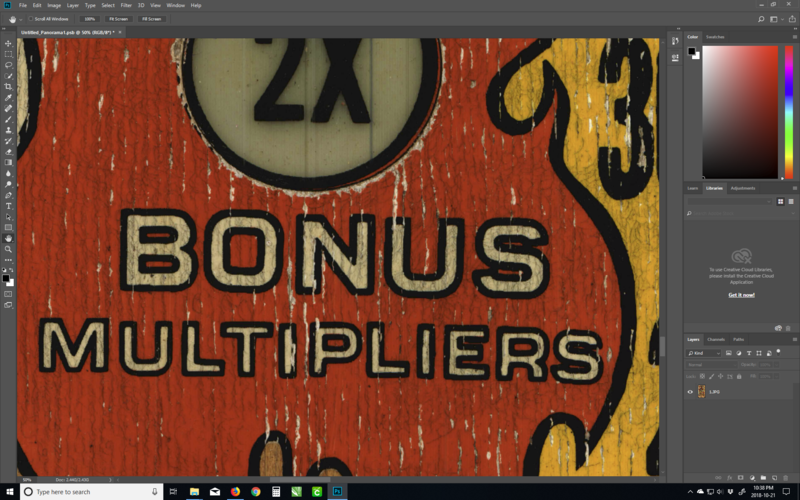 There's a few rough areas of grain, would these be best off filled? Wipe it with Naphtha and see how she looks. 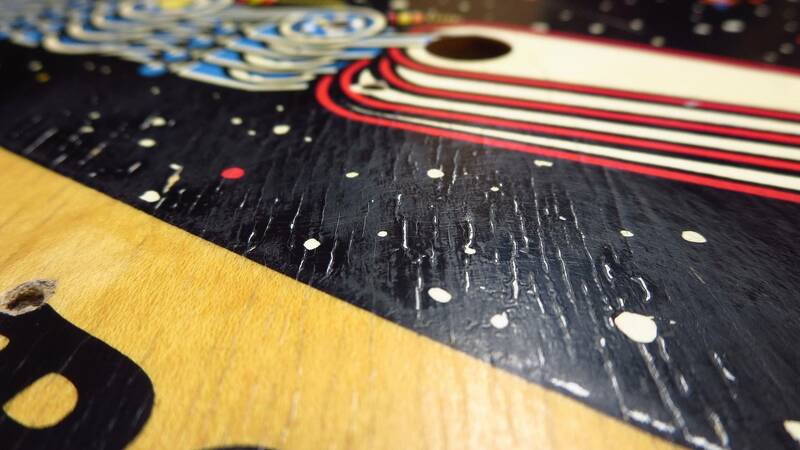 If it looks dirty, fill the holes with Wood Epoxy and repaint. 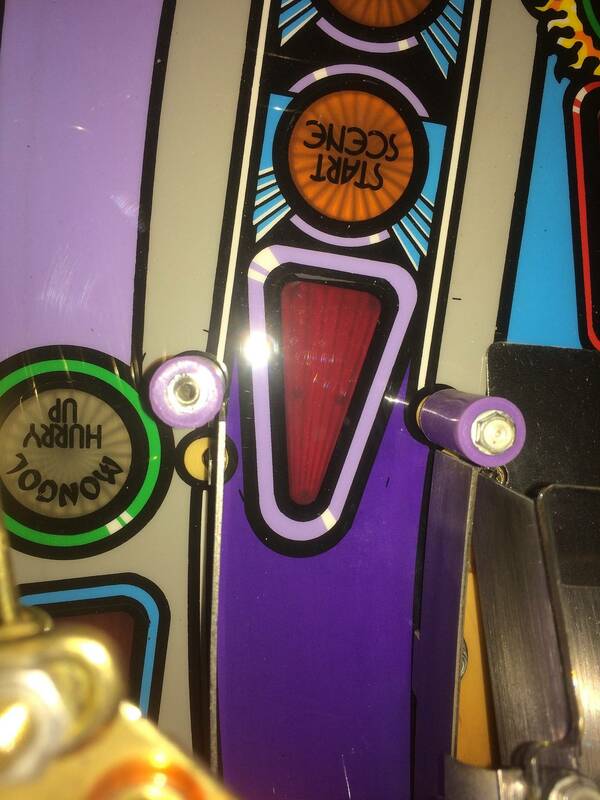 I've got some issues with a CPR silver Pinbot playfield. 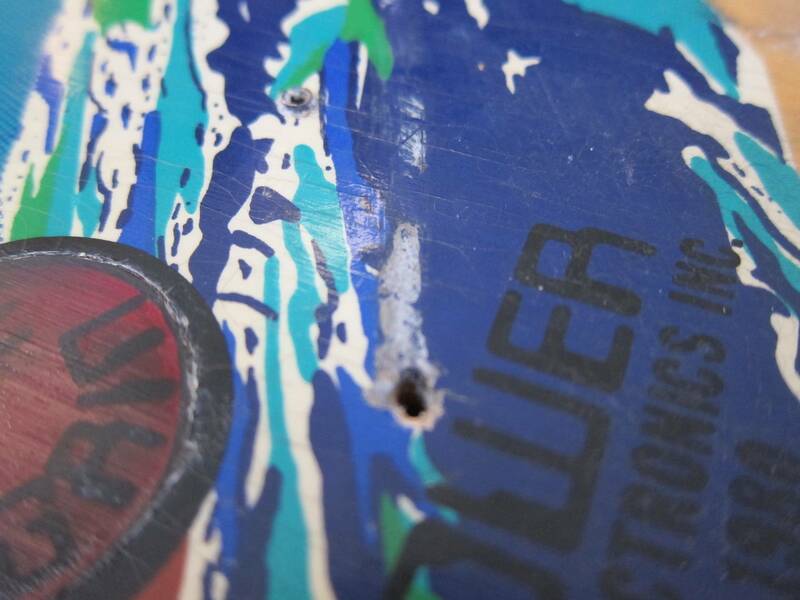 - One of the inserts in front of the drop targets looks like it had something on it was removed during the drying process. It looks like it pulled some of the color around the border. Not really sure of the best way to address this. 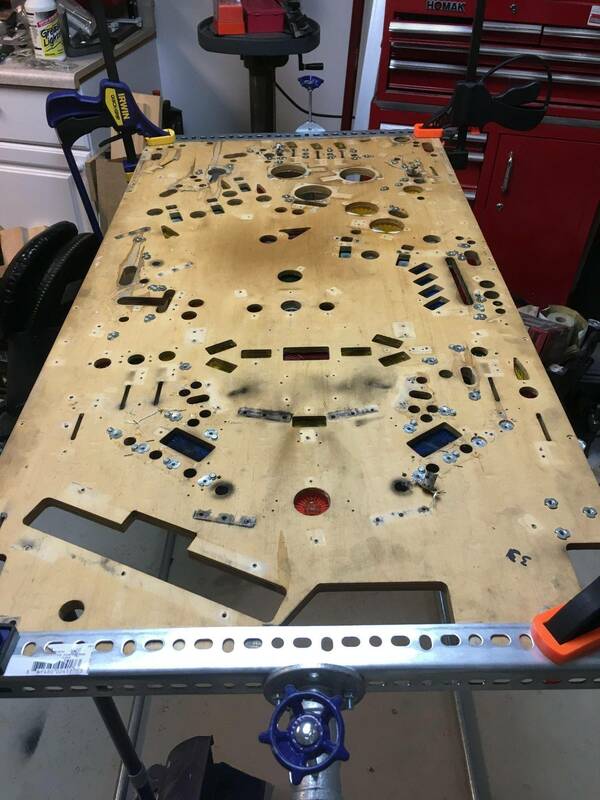 - The chest inserts have multiple areas, you can see two in the image, where it looks like something is stuck in the clear coat. I'm assuming I would need to lightly sand, remove debris if possible and touch up? - The clearcoat isn't that great. 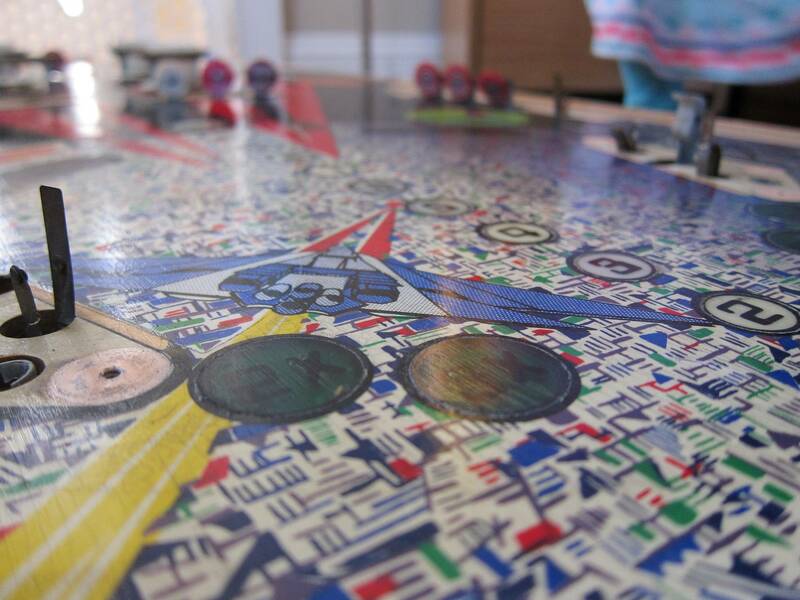 There are a lot of areas around the inserts where you feel the difference. I feel like I should get another couple of coats added, but I'm not sure what kind, etc. It does not look too bad, but you know why it was a Silver. 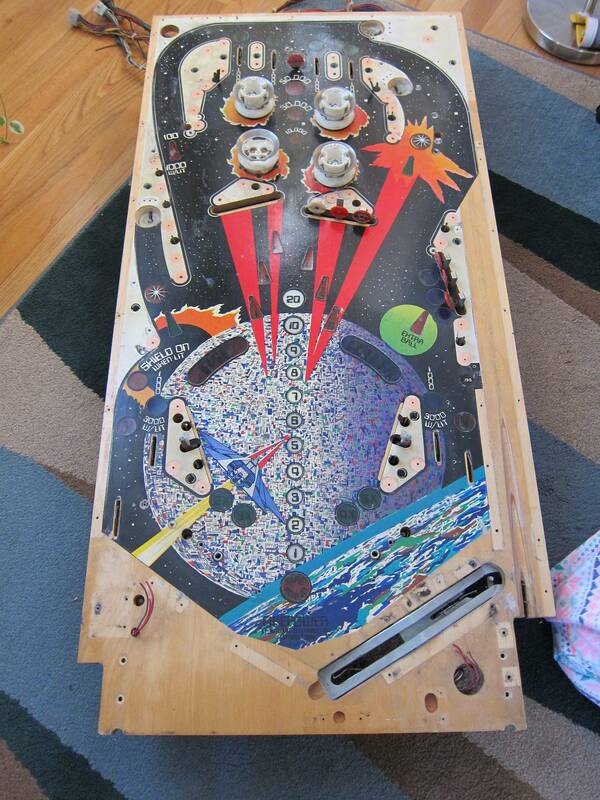 1. leave this playfield out of the wrapper for a month in a warm place so the wood shrinks as much as it's going to. 2. 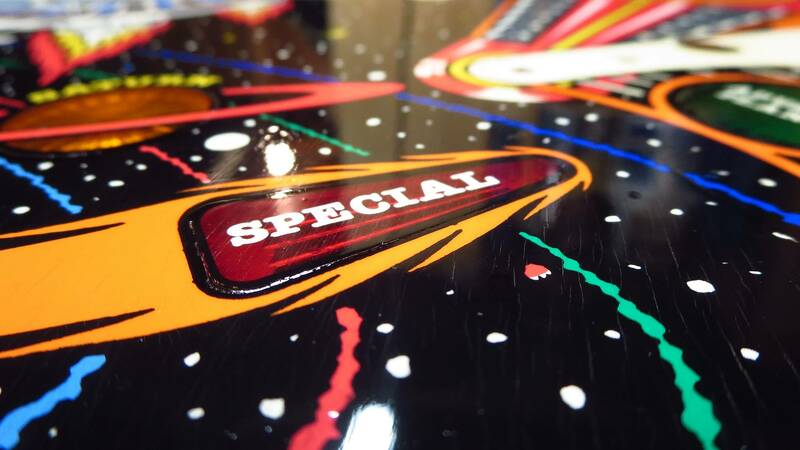 Lightly wet sand the whole playfield with 600 grit to degloss it. 3. Carefully rough-up the pits where the clear did not enter. The paint won't stick if you leave them shiny. 4. 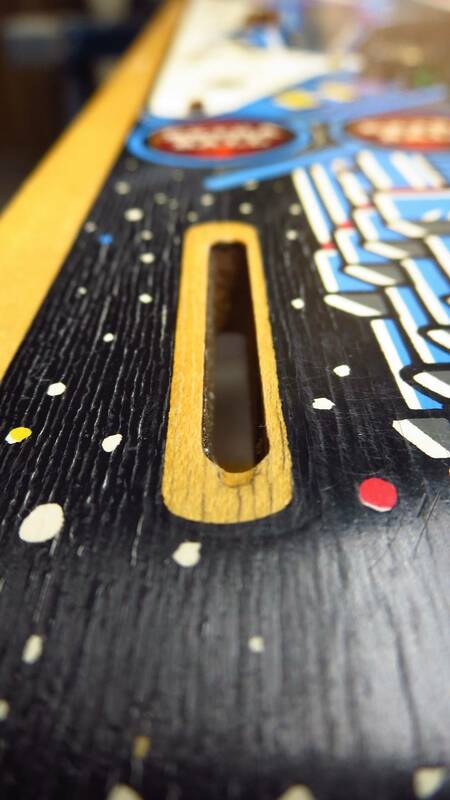 Light up the inserts from behind with a flashlight, and touch up any of the black keylines around the inserts. 5. Mix up your clear, but before you spray it, put a drop in each pit around the inserts. 6. Spray 2 coats of clear, sanding each coat dead flat. Thanks for all of this fantastic information and sharing your expertise. I've been looking for what to do about the damage in the attached image. It isn't a clear coat or a decal problem (I think). It appears to be inside the insert. 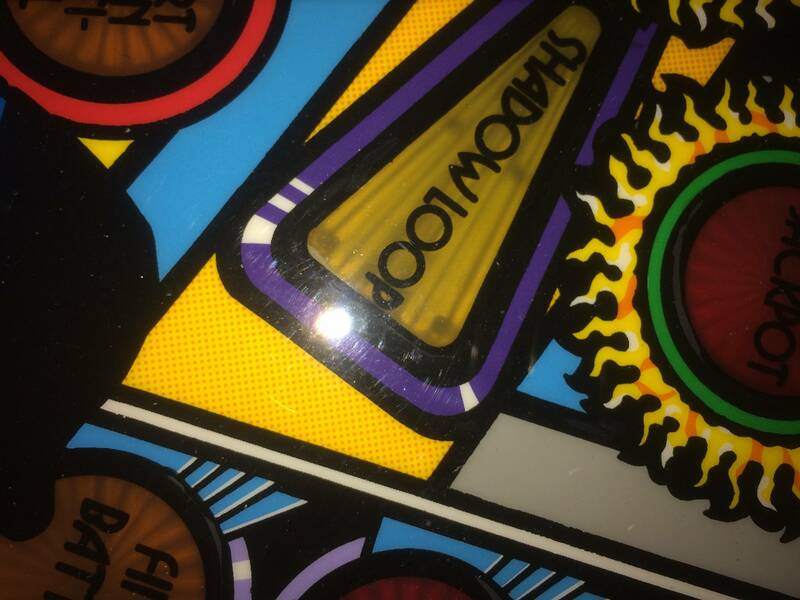 I don't feel the "cracks" on the back side of the insert or on the front surface. Is there a way to fix this without replacing the insert? Thanks again for your great contributions! Even if you buy a brand new insert, the same **problem** may happen again the moment you spray the clear on it. That is called "crazing" and it does not spread or get worse. When you sand an insert to make it flat, sometimes it exposes invisible internal fractures that only appear when the clear is applied. 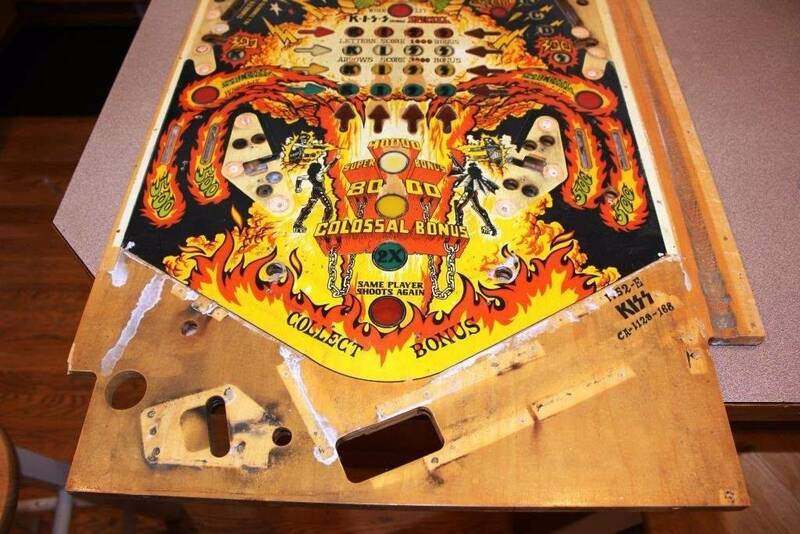 If this was a million dollar restoration, I guess you could buy 10 inserts, sand them flat, spray them with clear, and choose the best one to install. Thanks for the info and explanation. I don't know where'd I get a replacement anyway. I sent CPR an email enquiring if they had some "spares" to sell. No answer yet. Thanks again. You are da man! Even if CPR sold you one, it would probably be from the same batch. I did a quick search and only Orange and Green appear to be available right now. The US war on drugs was bigly successful in putting the largest percentage of the population behind bars of any country in the world. We beat China and Russia, that's no small feat! Not to turn this into any type of political discussion, but you are absolutely correct. Not only that, the estimated number of actual, for real innocent people locked up in prison ranges from 1% - 5%. Considering there are roughly 2.2 million people in prison, well.. The numbers are truly frightening. 1. Does my home in Florida count? We keep the house relatively cool @ 76-78. 4. Would an acrylic pen be sufficient? 5. Is there a recommended clear for CPR boards? 6. Flat as in level surface or surface finish? 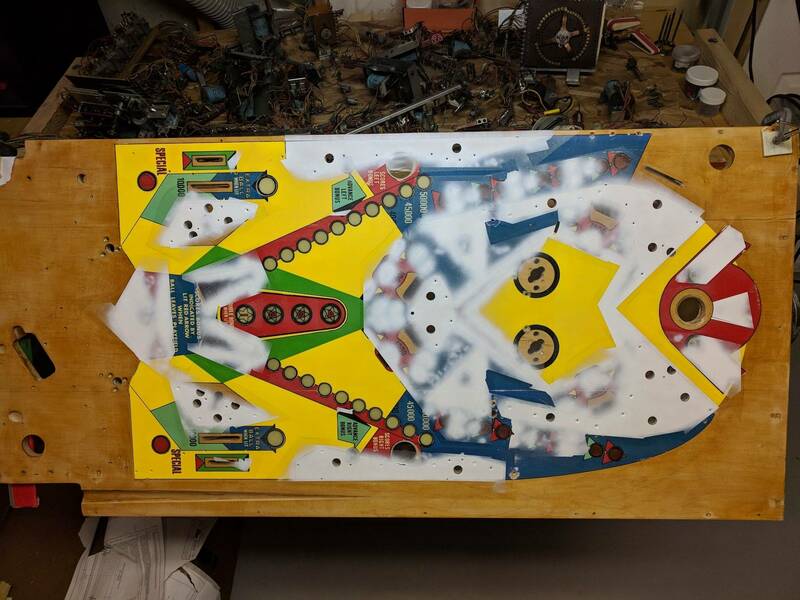 Apologies in advance, but I will probably have a ton of questions over the next few months as I restore my Hi-Deal playfield! I've read through this thread and read a ton of other restoration threads, so I have a general idea of the steps involved, but just to be sure, is this the order I should proceed in? Also I work 50 yards away from an automotive restoration business. I'm planning on asking them about spraying the clear coat for me. What should I ask for (i.e. type of clear coat, any technical specs)? Finally, I've cleaned once with naphtha and once with magic eraser/alcohol. Is that sufficient to clean off the waxes, etc that may have been there over the years? Thanks for all of the advice! I'm really excited to try this out!! This has all been covered many times in this thread... Read it!